Omega Psi Phi Fraternity, Inc. released an official statement late Sunday night regarding the Facebook Live shooting of a 74-year-old man that took place in Cleveland, Ohio on Sunday. 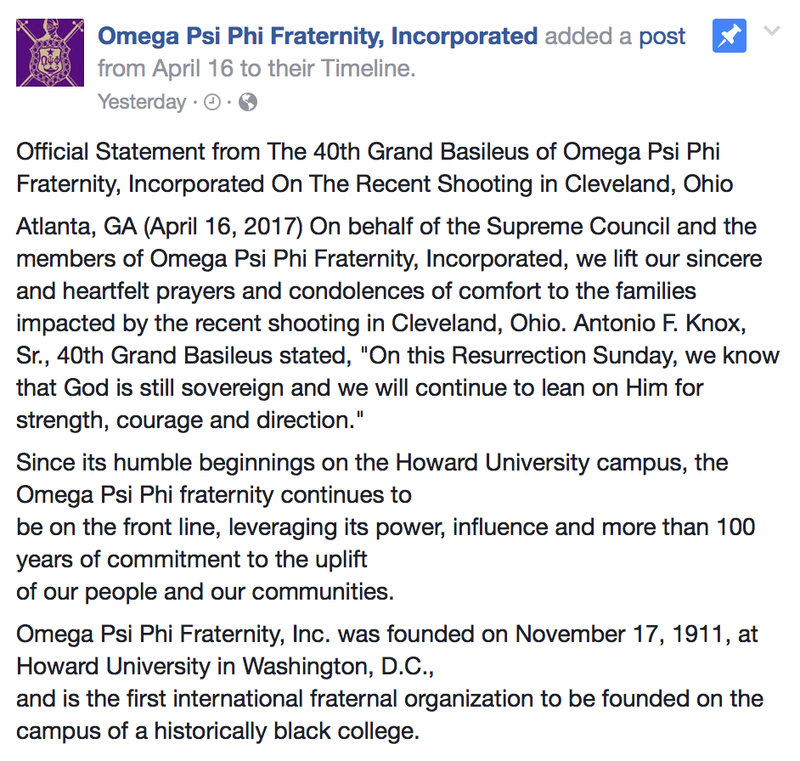 The fraternity’s Grand Basileus sent out an official statement about the shooting of Robert Goodwin. “On behalf of the Supreme Council and the members of Omega Psi Phi Fraternity, Incorporated, we lift our sincere and heartfelt prayers and condolences of comfort to the families impacted by the recent shooting in Cleveland, Ohio,” it said. Read the full statement that was posted to the fraternity’s official Facebook account below. Stevens Stephens, the shooter who is still at large, mentioned his fraternity, Omega Psi Phi, in one of his Facebook posts that was connected to the killing. “Police say Stephens, 37, of Cleveland, walked up to Robert Godwin Sr., a 74-year-old father of nine and grandfather of 14, on Sunday afternoon and fatally shot him on a sidewalk in the city’s Glenville neighborhood. Stephens posted a recording of the shooting on Facebook, then later posted another video laughing about the incident and claiming that he had killed more than a dozen other people.” Cleveland.com reports. He also claims he is going to randomly shoot “Greeks” in the head until he gets caught. “The vengeance is about to happen,” he said. Stevens is still at large and dangerous, police are saying that there is a chance he has left the state.